Discussing diet becomes a very delicate conversation as evident by the rates of increasing body image problems in the United States, among both boys and girls. Yet, there is appropriate ways to bring this conversation up to your loved one’s. 1. Avoid mentioning weight or size. 2. Approach them in a caring and sensitive manner. Initially it may seem that your child won’t be affected by your demeanor or tone, but children and adolescents are heavily heavily influenced by their environment. With parents making up a large portion of that environment, its important to understand that any rash comment may contribute to insecurities. 3. Use your child’s interests. For example, if they love to play basketball then transform the conversation into how much faster and better they will perform if they changed a few eating habits. 4. They are still kids. They aren’t perfect. They most likely don’t adore vegetables and obsess over healthy recipes. There should be no restrictive caloric, protein, or carbohydrate recommendation, but a more general approach to aim for increased vegetables, protein, and healthy snacks. Start somewhere, maybe that’s cutting back on soft drink and juice consumption. For breakfast, try replacing the sugar-dense cereals or oatmeals for a more nutrient-dense omelette, Greek yogurt with berries, or some cottage cheese with peaches. For Lunch, try replacing the school offered pizza or nachos with a whole grain sandwich or salad. Both with plenty of protein, whether its more slices of turkey and cheese on the sandwich or more chicken on the salad. For snack, try replacing the Doritos or Oreo’s with more protein-dense nuts and cheese, Greek yogurt cups, beef jerky, hard boiled eggs, or low-sugar protein bars. For dinner, try replacing the Mac and Cheese with Marinated chicken, steamed broccoli, and a smaller portion of whole grain pasta. Cut out added sugar where you can. Aim to sneak in 3-4 servings of vegetables a day. Try fitting them in at 2 or 3 different eating opportunities, for example lunch and dinner. For example, put some spinach and onion into eggs, some lettuce and tomato on a sandwich, cucumber and peanut butter for snack, and a salad with dinner. There’s millions of ways to sneak vegetables in, what will you try? Find what your kid loves, whether its soccer,running, swimming, skating, hiking, biking, basketball, etc. Then support them where you can, whether it’s signing them up for the proper teams and camps, or taking them to play when you get off work. 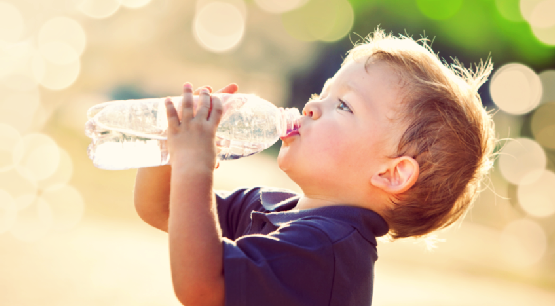 Encourage your child to stay hydrated! Drinking as much as 80-100 oz of water a day cant help in prevention of overeating and increasing metabolism. How can you help as a parent? Give your child a reusable water bottle to bring with them everywhere and create a habit of drinking a cup of water before each meal, for example drinking 10 oz of water approximately 10-15 minutes before lunch or dinner.